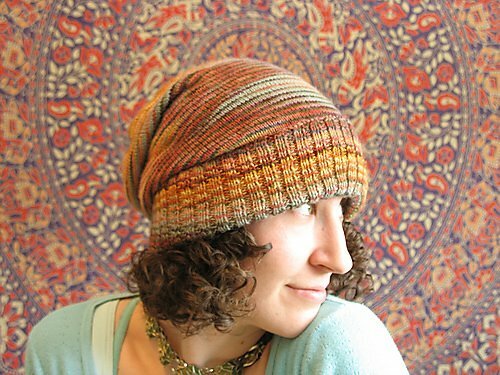 This slouchy, comfy hat is the perfect project for that one skein of sock yarn that is way too special to put on your feet. Fair warning: there is miles of stockinette stitch, so this makes for great TV, travel or zen knitting. The hat is simply constructed from the bottom to the crown. It is made up of a wide ribbed brim that folds up for extra warmth while the rest flops and folds over. This unisex hat has one size with instructions to adjust and no visible seam. The pattern is very versatile, so go ahead and get creative!